If you work with high-net worth clients, chances are you have frequent conversations about charitable giving. Many individuals are looking to give back to their alma maters or donate to philanthropic causes, but the structure of such donations and the tax ramifications involved can be tedious to sift through. 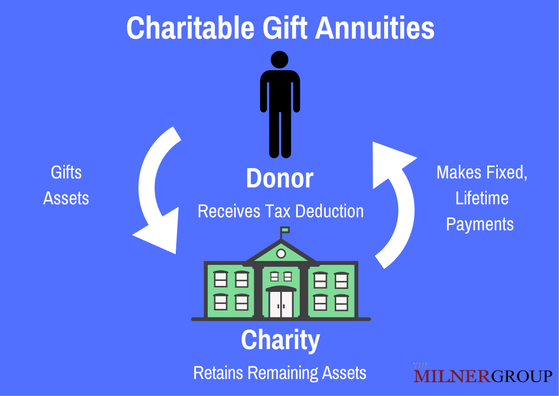 Fortunately, a Charitable Gift Annuity (CGA) is a straightforward insurance contract that can take care of both your clients and their charities. 1) It provides both lifetime income and a charitable deduction to the donor. 2) The charity involved receives the remainder of the assets once the donor passes away. Your client will give an irrevocable gift of an asset (such as cash, securities, real estate, etc.) to an organization of their choice who will then pay a fixed amount each year to your client (or another designated annuitant) for their lifetime, based on their age, gender, and interest rates. Note: it is actually the charity receiving the lifetime income from the insurance company. They then agree to pass the payments on to the donor. The client will also be able to claim a tax deduction in the year of the donation. The income stream they receive may also carry additional tax benefits. When your client passes away, the charity retains the remaining portion of the given assets. A 75-year old male donating $100,000 via a CGA could receive payments of ~$5,000 for life and a tax deduction for anywhere between $12,000-15,000 in the year of their donation (assuming a 35% tax bracket). Of the payments, only a portion (the interest) will be taxable to the donor at ordinary income rates. Most major universities and charities have designated CGA programs in place complete with guidelines, rates, and additional information. There is typically a minimum amount accepted of between $10,000-20,000, and many organizations offer the ability for donors to have input as to how their gift is used. Working directly with these organizations is a great way to allow your clients to enjoy income and tax savings now while knowing they will be leaving a gift to support what they are passionate about. For additional CGA resources and details, contact one of our Annuity specialists and be sure to watch the webinar below.